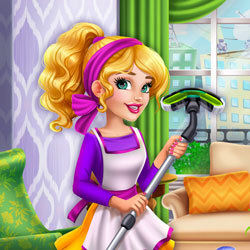 Description: Audrey has a beautiful house, but she wants to start spring-cleaning! She needs your help to vacuum, clean the grimy windows and repair the tears in the wallpaper. After that you can decorate her living room together and change her outfit!